Each year, we compile a list of players who will be suspended going into Week One and compare the importance of those suspensions. We’ll do this using our Football Relativity scale, with the 10 level holding the most significant suspension and the 1 level marking the least significant. We’ll start a new post once the season starts. 10 – Vikings DT Kevin Williams and Saints DE Will Smith (2 games for violating league’s performance-enhancing substance policy) – For three years, the StarCaps case lingered over four players. It lingered so long that two of them – NT Pat Williams and DE Charles Grant – aren’t even in the league right now. But the league finally settled and gave the Williams Wall, Smith, and Grant two-game suspensions with additional fines of two game checks. That’s a blow to both the Vikings and Saints, who lose top DL starters, but it’s not as bad as it could have been. 8 – Bengals OG Bobbie Williams (4 games for violating league’s performance-enhancing substance policy) – Williams, who had started all but 3 games at right guard for the Bengals over the last seven years, has become one of the league’s better run-blocking guards. But he will miss the first four games of the season due to a suspension. It’s a huge blow to the Bengals, who lack consistency on the offensive line around Williams. 5 – Redskins CB Phillip Buchanan (4 games for violating league’s performance-enhancing substance policy) – Buchanon, who re-signed with the Redskins this offseason, will be benched for four games for violating the league’s performance-enhancing substance policy. He started five games last year and played all 16. The Redskins will likely rely on him as their third corner, so given that important role he’s a loss for the first quarter of the season. 4 – Titans FB Ahmard Hall (4 games for violating league’s performance-enhancing substance policy) – Hall, the Titans’ starting fullback, said he failed a test for performance enhancers because of a medicine he took to remain awake. Regardless, he will miss the first quarter of the season. The suspension didn’t just cost the Titans Hall; it also cost them a draft pick, since they traded for Quinn Johnson to replace him. It’ll be interesting to see if Hall can overtake Johnson and seize his job back once he returns. 1 – Ravens WR David Reed (1 game for violating league’s substance-abuse policy) – Reed, a second-year player who is the Ravens’ primary kickoff returner, drew a one-game suspension for violating the substance-abuse policy. He’ll miss the opener against the Steelers, which is a blow to the Ravens in a key rivalry game. Thoughts on the AFC Championship game, in which the Colts beat the Jets 30-17, and the NFC Championship game, in which the Saints beat the Vikings 31-28 in overtime. *The Colts showed their moxie by coming back from a 17-6 deficit without panic. The touchdown Peyton Manning led before the half completely flipped the momentum, sparking the comeback. That’s the second time in the playoffs that Manning has led such a drive (with the permission of a coaching staff that isn’t afraid to let him try). *Austin Collie and Pierre Garcon had to step up in this game because Reggie Wayne was vacationing on Revis Island, and they did. Both went over 100 yards in the game. Their emergence is what has taken the Colts offense from good to great. *The Jets got off to a great start, and so did Mark Sanchez, but once they fell behind it was pretty clear that Sanchez didn’t have the weapons to return. Sanchez is a winner and a gamer, and his personality is a great match for Rex Ryan. But New York needs more explosiveness – even in games when Braylon Edwards actually makes the big catch. *Bart Scott gets more pub, but David Harris is the best linebacker the Jets have. 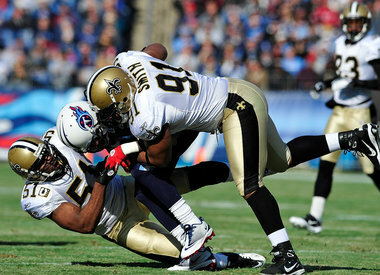 He showed that with 11 tackles and 2 sacks in this game, which was confirmation of his fabulous play all year. *Props to Jim Caldwell, whom I predicted before the season would kill the Colts. He hasn’t done that, and he may get a George Seifert-esque Super Bowl title out of it. *In the Saints/Vikings game, the moment everybody will remember is Garrett Hartley’s clutch kick. But the Brett Favre interception at the end of the fourth quarter – which was so reminiscent of his overtime pick in the NFC title game in Green Bay two seasons ago – is what I’ll remember. I don’t know why, but I saw this pick coming, both before the game and in the moment (just ask my wife). This is the reason that Favre will be remembered as a great quarterback but not as the greatest of all time, no matter what the stats say. Favre was only briefly the best QB in the league – he took the mantle sometime at the end of John Elway’s career and was surpassed by Peyton Manning and Tom Brady a few years later. His mistakes in key moments are part of his legacy, for good or for ill.
*As for the Saints, they survived against a good Vikings defense because their defense pressured Favre and forced turnovers. Forcing six fumbles (recovering three), and adding two crucial interceptions, is why they’re going to Miami. CB Tracy Porter and LB Jonathan Vilma each forced a fumble and had an interception, and the fumble Will Smith forced in the fourth quarter led to the Saints’ final touchdown. That opportunistic defense has been key for New Orleans all season, and it was good to see it show up on the big stage. *For a game with just one total sack, both Favre and Drew Brees got beaten up throughout the game. The Vikings’ D-line is the best in the league because all four starters (and some of the reserves too) are too much to handle. But despite the pressure, Favre and Brees both still made big-time plays. Both are terrific quarterbacks. *Adrian Peterson showed up in this big game, although his fumbling problems ended up being crucial. But he’s a huge talent who can be the centerpiece of the offense. *Of all the stars in the Saints’ offensive attack, the brightest on Sunday was Pierre Thomas. Not only did he score two touchdowns; his overtime kickoff return was a huge key to setting up the game-winning field goal. Thomas is often overlooked, but he’s a nice back to have to complement Reggie Bush. And the way that Thomas held onto the ball when Chad Greenway put his helmet on it on the 4th-and-1 dive in overtime saved the game.